This year sees the partial opening of the Grand Egyptian Museum (GEM) near the pyramids of Giza. It is the cultural cornerstone of a government convinced that the lure of the pharaohs will revive the country’s economy and improve its image abroad, despite the fact that terrorism has blown up its tourist industry: 14.7 million visitors in 2010; 5.4 million in 2016. Last year, that same government took a step certain to hobble Egypt’s cultural life and socio- economic development. At the end of May, it enacted a law against non-governmental organisations (NGOs)—there are 47,000 in the country—that severely restricts their activities, imposes harsh penalties on accepting money from abroad and even discourages small donations by citizens. Although the law is aimed principally at human rights organisations, cultural life is also affected, because most grassroots cultural enterprises in Egypt are NGOs. The Ford Foundation, active in Egypt since the early 1950s, has already taken fright and discontinued its grants for cultural activities. One of the most effective cultural NGOs has been the Townhouse, founded by the Canadian William Wells in 1998. It used to run artists’ residencies, with artists teaching adolescent workers in nearby factories on their one free day a week. In 2015, along with most NGOS catering for the poor, it came under investigation. But it had already fallen foul of the authorities, in 1999; its centre in which street children made art was closed because, ostensibly, street children did not exist. Now, with much reduced funding, the Townhouse operates out of a disused factory with a staff of just four. It still has its art library, puts on exhibitions, sells work by contemporary artists and runs critical-writing classes, for which there is hot demand, as the Egyptian educational system does not encourage independent thought. The Townhouse is downtown, and as you pick your way past filthy, decrepit Beaux-Arts and Art Deco buildings, it is hard to imagine that until 70 years ago, this was the neighbourhood that led to Cairo being called the Paris of the Nile. Encouraged by the government, which wants to transfer the administration outside the city, investors are now building neighbourhoods with names like Hyde Park and Portofino out in the suburbs, replicating America’s post-war flight to the suburbs, a process that US cities are busy trying to reverse. Leaving the European heart of Cairo to rot further impoverishes so-called Islamic Cairo next to it, which traded with and serviced its once-rich neighbour. Thirteen hundred years of illustrious Islamic civilisation are embedded here, with one magnificent mosque and madrasa after another, yet this neighbourhood is viewed with suspicion by the authorities and, with the exception of its finest monuments, abandoned to its fate. Cairo could be like Barcelona; instead, it is being turned into a failed city, and a failed city breeds disaffection. King Tut and all his treasures are also moving out, to the GEM, and the question is: what to do with the old Egyptian Museum? 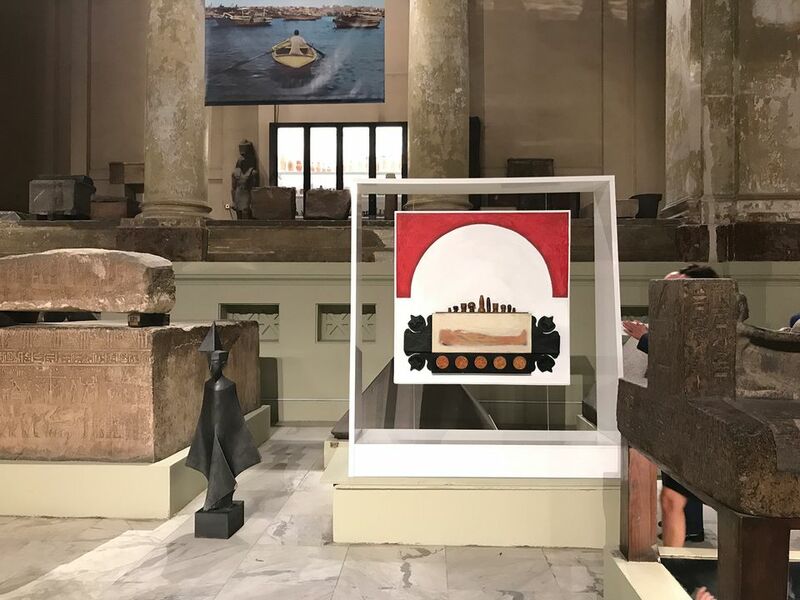 Much of the Egyptian collection will remain there, but it needs an extra pole of attraction if visitors are not to bypass it for its shiny new successor. The interior decorator Nadine Abdel-Ghaffar believes that it should become a platform for Egyptian contemporary art, for which she runs a website called Art D’Egypte that provides curatorial services to artists, public spaces, museums and collectors. She persuaded the authorities to let her mount a pop-up show of 16 contemporary artists called Eternal Light: Something Old, Something New in the museum last October, and managed to cajole Philips into installing modern lighting in the galleries of this famously dingy museum. “We need to draw attention to the museum now that GEM is opening; we need public-private collaboration,” she says. Good for her that she has managed to achieve this much; wealthy Cairenes have been slow to back their own society. But what can a few individuals do when the government distrusts and disempowers the most engaged of its 98 million citizens?